Once Upon a Learning Adventure: How to Start Building Relationships with Students Even Before the First Day of School! How to Start Building Relationships with Students Even Before the First Day of School! Have you gotten your class list yet? Are you torn somewhere between the excitement of a fresh start with a new batch of kiddos and the uncertainty of what this year will bring? I always love to see those sweet names all lined up in alphabetical order, but as soon as those lists are published, my brain starts going a mile a minute! The butterflies start fluttering in my stomach as I wonder things like...Will this group get along well? Who will the strong leaders be? Will "that kiddo" I heard about last year really be THAT challenging? How will I meet all of their needs? Will I be able to make a difference to each of them? 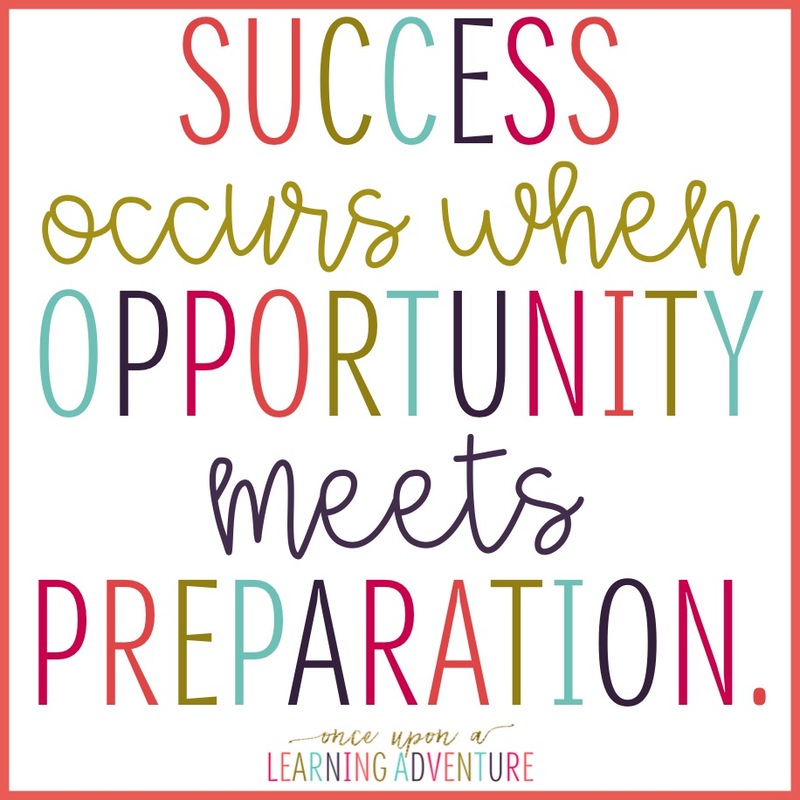 One of my absolute favorite quotes is, "Success occurs when opportunity meets preparation." Each new school year, we have the opportunity to be successful in creating a community of deep thinkers and compassionate classmates. Rather than worrying about whether success is going to happen, I love how this quote encourages us to act and prepare for success in advance. So, instead of worrying about what kind of classroom community you're going to have this year or how the school year will pan out, here are five steps you can take to build relationships with students and start building your classroom community even before the school year starts! 1. Create your classroom meeting routine. One of the most important parts of the school day in my classroom is our classroom meeting time. 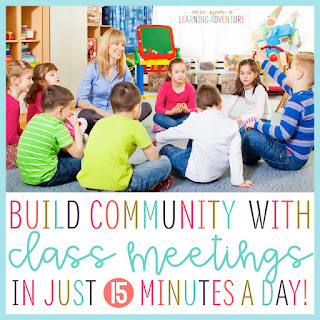 I really believe this time is essential to my classroom community's success, so I dedicate about 15 minutes per day to class meetings. The classroom meeting routine that works best for me is to have an independent Morning Message during morning work time, then a group meeting that features a Greeting, Thanks & Thoughts, Share & Shine, and a Talk-It-Out Topic Time. If you'd like to read about my classroom meeting routines in more detail, check out my blog post here. 2. 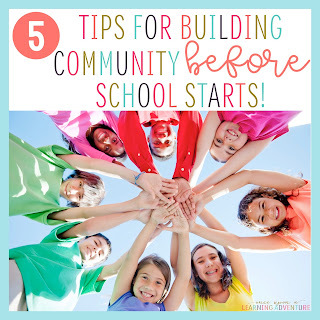 Plan community-building activities for the first few weeks of school. Before you dive into your curriculum for the year, take some time to provide opportunities for your students to get to know one another and to build relationships. The flexible schedule in the first few weeks of school provides the perfect time for this! I love scouring blogs and Pinterest for new icebreakers and community building exercises over the summer, and I have a full Pinterest board of ideas you're welcome to check out! One of our favorite class activities every year is the All About Me Backpack. Each student creates their own backpack, which features answers to several getting-to-know-you type questions. Then, the students fill their backpacks with photos and small memorabilia. Over the first two weeks of school, the students and I take turns sharing our backpacks with the class, and it is amazing what we learn about each other during this time! You can check out my All About Me Backpack here. 3. Create a home away from home where your students have a place in your classroom. I like to think of my classroom as a shared space with my students, so I want them to feel at home in the place where they will spend most of their days. Because I want the classroom to be "ours," I simply set up my desk and the bare bones of the room such as our library, work and meeting spaces. I leave lots of space available on my walls to be filled later with student work, and I also have picture frames displayed that are ready to be filled with images of our class. This makes our room feel so much more welcoming, and the kids love to reflect on past memories as they see the photos throughout the year! 4. Get helpful information from last year's teachers, but give each child a fresh start. I don't know if your school is like this or not, but in every school I've worked at, once class lists are posted, there is a lot of "teacher talk." You know, well-intentioned teachers sharing information about their former students with their new teachers. In many ways, this information can be essential to ensuring the success of a student transitioning from one grade level to the next. Perhaps the student is on a behavior plan that needs to be continued or maybe there is important health or family information that needs to passed along. If you are the recipient of this information, I encourage you to accept it gracefully and thankfully, but keep in mind that the student deserves a fresh start each year. Even if "that kid" is placed in your classroom, you want to set him or her up for success, so I encourage you to use the shared information to help him or her as you best see fit, but to also allow him or her the chance to have a clean slate. You never know, sometimes a fresh start with a positive and supportive environment is just what a child needs to turn things around! 5. Reach out to students and parents in advance. Don't you just love getting mail? I don't mean bills and the everyday junk we all get, but actual cards or letters meant just for you?! I love the excitement of opening and reading letters and cards written personally to me, and I can tell you from experience, your students (and their parents) will too! Each summer, I send a letter to my new students introducing myself and welcoming them to my class, and if possible, I highly recommend this. At "Meet the Teacher Night," the students and their parents have a connection with me before they even enter the classroom. Many students and parents will start conversations with me about ideas I shared in my letter, and it is such a comforting feeling for them (and for me as well) to already have had the ice broken before we've even met! If you need ideas for your own student or parent letters, check out my editable template here. 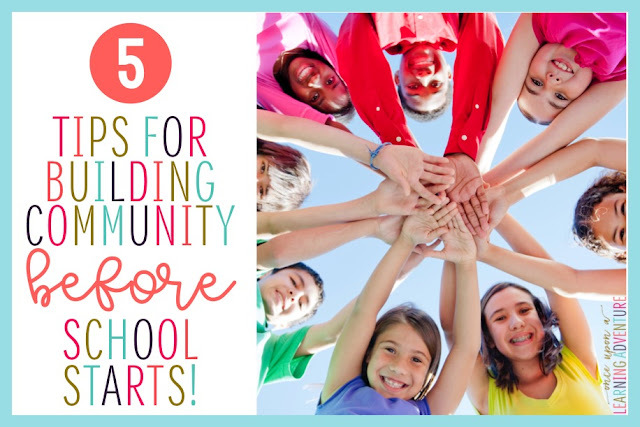 Now that you've read my five tips for building relationships before the school year starts, I hope you'll give one or two a try and let me know how things go! Or, if you have any tried and true tips for building community with your own students, feel free to share them! I really believe that the time we take to prepare for building community can make a huge difference! 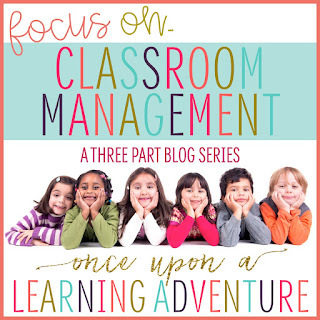 If you loved this post and would like to learn more about Classroom Management or How to Build Classroom Community, check out my other posts below! Learning is an adventure all right. The most important thing for the educator to do is to define what role are you going to play on this adventure. Whether you will be their teacher or their friend as well. Whether you will be strict or compassionate. Whether you let them buy college essay or just give all the material yourself. In order to make such serious decision, you have to read blogs like this. Here is the perfect place to read about someone’s experience and take the advice. Love the picture frames with class photo coming soon sign! Did you make the sign or buy it? I would love to do this! Warid Daily SMS Packages Daily, Weekly, Monthly 2018-19.Warid/Jazz has over 55 million subscribers in Pakistan. Warid’s merger with Jazz made it the leading telecom operator in the country. In this article, we will tell our readers about the Warid SMS Packages Daily, Weekly, Monthly 2018-19. Kidsare very sensitive one has to build a relationship in order for to understand them and also for them to be free with you. First day of school can be challenging and therefore trying to build a student and teacher relationship comes in handy.